E-mail: jmundinger@montana.com John started fishing at a young age, but took a break from fishing when his children were young. He got serious about fishing again after fulfilling a childhood dream of learning to tie his own flies. In 1998, he took an early retirement from Montana Fish, Wildlife and Parks and is now self-employed as a natural resource management consultant. Here in Montana, I have had good success fishing small brassies on the Missouri River. I often fish size 18's in tandem with small parachutes during midge and BWO hatches, and I have caught browns and rainbows up to about 20 inches on this little fly. Thus, while preparing for my first (only) Alaska trip, I was intrigued to discover that Alaska FlyFishers included the brassie among the patterns recommended for salmon. During the July 2000 trip, the brassie was the most productive pattern in my box. I caught my first salmon on a brassie! I was able to land several Pinks in the 3 to 5 pound range and a number of Chum in the 8 to 12 pound range. I also hooked, but did not land, one or two Sockeye that were in the 10 pound range... all on the six size 8 brassies I brought on the trip. The fly that caught the first salmon was saved as a memento of the trip, and was the only brassie that came home with me. The other five were lost, along with the fish that ate them. I have not yet scheduled my return trip to Alaska's Italio River, but I already have a couple dozen brassies ready to go. 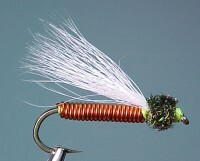 Tying Tip: Prepare the wire abdomen ahead of time. Cut the three strands of wire to length, clamp the ends in the vise and twist together to form a single wire. 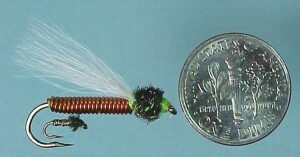 The resulting wire should be long enough to tie several flies. Thorax: Several strands of twisted peacock herl. Tying Tip: To ensure more uniform fullness and durability, I prefer to spin the strands of peacock herl in a dubbing loop.